The Cement and Environment Labor Foundation (Fundación CEMA) has published an informative leaflet on the energy recovery of waste to disseminate to society the benefits of this practice of the cement industry. 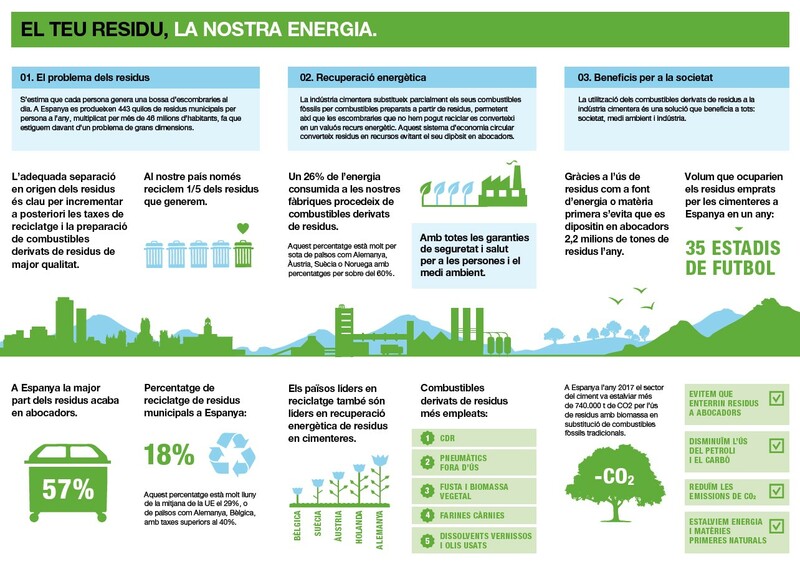 The brochure introduces, summarizes and clarifies the concepts related to the energy reuse of waste, an activity that reduces waste and, therefore, represents an environmental contribution. With the title “Your waste, our energy“, the brochure explains that 26% of the energy consumed in the Spanish cement factories comes from fuels derived from waste, a use that is still far from the percentages higher than 60% of nations such as Germany, Austria, Sweden or Norway. The triptych of the CEMA Foundation – an entity created by the employer association Oficemen and the CCOO and UGT trade unions – defends the principles of the Circular Economy, which considers waste a resource. It analyzes the situation of the sector in Spain, where 57% of all waste goes to landfill, and presents the recovery of the calorific potential of these materials as an opportunity to save fossil fuels and CO2 emissions in cement factories. The brochure concludes by highlighting – with concrete figures – the contribution of the cement industry to the waste energy reuse. The triptych can be downloaded directly from the CEMA Foundation website and will be distributed in printed form by all the cement factories. The objective of the work is to explain in a concise and understandable way to citizens and institutions the energetic recovery of waste in cement plants and the benefits that this practice entails.